There are many good golf books available that can truly help you with your game. I’m not gonna spend a lot of time on a fancy intro, so here’s a list of the books I’ve read that I think will help you lower your scores. 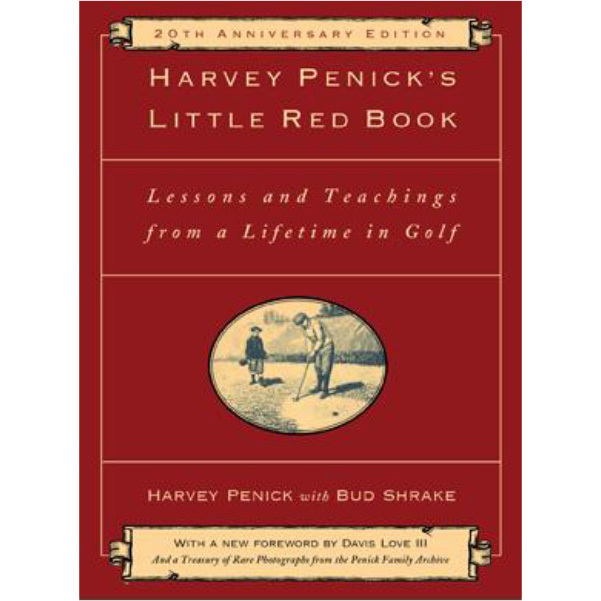 Harvey Penick’s “Little Red Book: Lessons and Teachings from a Lifetime in Golf”. Seriously, this book appears to be just thoughts and stories from an old caddy, but it’s actually chock-full of useful information. I love how it gives you information, something you might just give passing thought to, but then out of the blue you think “damn… that’s what he was talking about!”. It’s actually the inspiration for all of my golf swing musings. Bobby Clampett: “The Impact Zone”. This book is what turned my ball-striking around. It’s a very simple concept, one that I talk a little about in another post, but take it from me: it gives powerful results. What’s more, this book showed me that you can truly work on your golf game anywhere, so long as you’re focusing on the task at hand. What needs to be said? This is straight from one of the game’s best ball-strikers and competitors. The thing with this book for me was, I was afraid that it’d be super-complex and hard to understand. I couldn’t have been more wrong. It’s another source of inspiration for me, with Hogan’s No-BS approach to golf. It’s another source of inspiration for me; Hogan had a No-BS approach to golf, and his instruction was no different. People talk about his “secret” and what it was or could be… but he wasn’t a cryptic guy. Tne secret was there was no secret- you gotta find your way in golf. Jack Nicklaus: “Golf My Way”. Another golf book that really needs no introduction. This manual helped shape the careers of other pros, Johnny Miller and KJ Choi, for example. It can shape yours, as well. Dr. Bob Rotella: “Golf is Not a Game of Perfect”. A great book about managing expectations. If some of the people I play with are a good sample, this book is worth a look for those that step onto the course expecting to shatter the course record just by showing up. Remember, golf’s not a game of good shots, but managing your misses! Dave Pelz: “Dave Pelz’s Short Game Bible”. Everyone can use help with the short game, and Dave Pelz is one of the best. The average adult male drives the ball 200 yards, give or take, so it’s never a bad idea to make sure the short game’s pretty tight. It’ll help you save strokes that can add up and ruin a good round! Jon Sherman: “101 Mistakes Golfers Make (and how to fix them)”. Another great read, from a guy that “gets it” about playing Common Sense Golf. Follow him on Twitter for more good insight! Easy to use, easy to read, and based on the “80/20” methodology! Now, because I can, I’m going to add my book… but mine’s farther down on the importance list compared to these. My book, “The Truth About Golf Shafts”, is much more focused on a part of the golf club. While I think it can help when you’re in the market for a new golf club/golf shaft, everything listed above will help you on the course. You can buy it on Amazon here: The Truth About Golf Shafts: Things You Know, Things You Don’t Know, and Things You Might Not Want to Know About the Golf Shaft .